Arcanine has a Total Base of 555, it's honorable. It is outclassing starter Pokemon and some of the best Pokemon overall like Magnezone. 555 is high. Rapidash has a Total Base of 500. It's not bad, it's just overpowered. It was good, before that Arcanine came. Arcanine's Abilities are Intimidate, Flash Fire and Justified. The first is useful; if somebody planes to Bulk up, he will have to do twice to receive an attack boot. The second has its use ; You can switch Ferrothorn facing another Arcanine to take the hit and receive nothing but boost in Fire Attacks. Finally, the last one can work but seldom. You can use it in double with Beat Up Weavile at your side so that Arcanine takes damage and boosts attack, while Lucario do the job better, Cobalion can even. 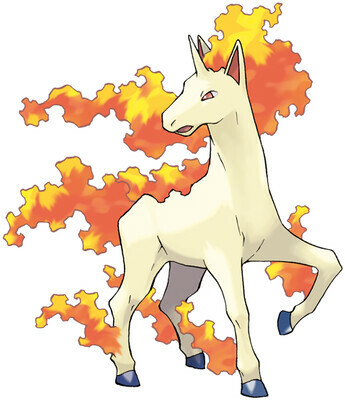 Rapidash's Abilities are Flash Fire, Run Away and Flame Body. The first one is the one you will always use, for the same purpose as Arcanine but in a much weaker situation. The second is competitively useless as it has no effect in-battle, just to let you run away from wild Pokemon. It cannot be used, as Rapidash has enough speed to outspeed wild Pokemon. The Last one is not much used, because Rapidash's bulk, 65 HP / 70 DEF / 80 sp.DEF is a joke ; Rapidash cannot take a physical hit in a competitive battle before to die. OK I know you want this for LeafGreen and FireRed, I'm giving advices in every place. In any fact, take Arcanine. 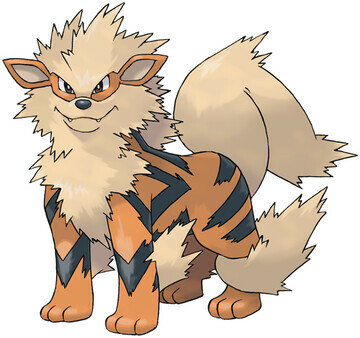 Arcanine's offensives are 110 ATK / 100 sp.ATK, making it able to use both physical and special attacks easily. Its movepool is a complement to this. Rapidash's offensive are 100 ATK / 80 sp.ATK, which is seriously weaker. Arcanine is capable of much more than Rapidash. Arcanine's bulk is nice ; 90 HP / 80 DEF / 80 sp.DEF, which outclasses by far other Fire Pokemon that has its purpose. Rapidash's bulk is a vast joke compared to Arcanine : 65 HP / 70 DEF / 80 sp.DEF. Ridiculous. Arcanine's speed is 95. It's good, but if it was higher, Arcanine could be easily OU. The movepool that Arcanine could use in Gen I is bad compared to today, but Rapidash's is not better. Limit, these are strong moves, while in Gen I, I ain't sure there was better. And I think that's it. Arcanine is largely better. For Gen I. This question is for generation 3. Arcanine has a total base stat of 555. It has Excellent Attack and Special attack, Good Hp, Defense, Sp.Def, and Speed. Also Arcanine has a pretty interesting movepool, with some good egg moves for double battles (ex: Heat Wave) and good TM moves as well. Rapidash has a total base stat of 500, as you can see its 50 points below Arcanine's. Rapidash has Excellent Attack and Speed, so it outspeeds Arcanine, but Arcanine can learn Extremespeed so thats a bonus. Rapidash has decent Def, Sp.Atk, and Sp.Def. However Rapidash's Hp isnt the best. Rapidash does have some pretty good TM moves, like Solarbeam for coverage. Adding up to everything, I would say Arcanine is the best choice due to its awesome stats and movepool, having very powerful STAB moves. I prefer arcanine due to higher attack and stats overall. It really depends on your team. Arcanine has a greater movepool, with moves like outrage (For those pesky Kingdra and Flygon), reliable STAB and coverage moves to par with its higher attack. Great in sun. EDIT: Opps, I just realised its a Fire red team, but still, arcanine has a much greater movepool and moves to par with its ok special attack and attack, but not rapidash, as its special attack is horrible, and the STAB moves it has is special. answered Oct 7, 2013 by WhiteKyurem.